I will not be making a blog entry until August 1st. I will be preparing for the conference in New Hampshire or at the conference. I devoted a day to getting my handouts and kits prepared and shipped off to the conference. I had to get them there by the 16th. I tend to put off things like that so I wind up shlepping an extra very heavy suitcase. Not this year! Just a few lessons arrived for review. I am really under the wire for getting stuff knit for the Winter Issue of Cast On. I looked at a calendar the other day and realized I am running out of time, especially since I will not be able to get much knitting done while at the conference. On a different (less whiny note), I got a list of my students signed up for the Finishing Course in NH and I contacted them all to see if they wanted PDF copies of the handout before the course. The handout has so many photographs which don't copy all that well so I want them to have the chance to get a color copy if they want it or to load it onto a tablet. Most have contacted me to get the files. This is the final entry for intarsia. When I was reviewing for the Masters Program, many Level 2 knitters could do the argyle sock but the final result was ruined by how they wove in the yarn tails. Anyone who has purchased a Christmas sweater knit in Asia knows what I mean. If you look at the inside of those sweaters you will find a collection of knots. If the sweater is tight all of those knots mean that it doesn't stretch all that attractively accross the chest. There may be holes or Santa's hat may be distorted. It is especially noticeable on a sock. An intarsia design isn't complete until the ends are woven in. This also gives you an opportunity to clean up the design. If you notice any overly large stitches you can use a tapestry needle to shift the excess yarn the closest yarn tail. Experience has taught me that the best way to weave in a yarn tail in stockinette in the middle of a row is to use the duplicate stitch method. I have done TONS of videos on this and several blog entries (just check the index). The problem with doing this on an intarsia design is that the stitch path can be difficult to see. The key thing is to look at the RS of the work as you do it to make sure the tail doesn't show through and doesn't distort the design. Stretch it! 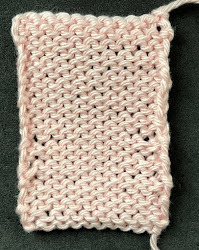 This technique requires that you weave in the yarn in the direction the yarn tail would have taken if it were knit. This can cause panic as it mean that the yarn tail will cross over into another color. If you slightly split the stitches as you weave in the tail, this guarantees that the tail will stay on the WS of the work and won't poke through. I've woven black yarn over white with no problems. Salon will be on Sunday this week from 1:30-3:20. Hope you can make it! I've started on the Nordic Sweaters. They are so much fun! There will be three...one for a baby, one for a child and one for an adult. I am doing different designs for the sizes. The baby size has a fawn instead of a deer. It is unbelievably cute. The yarn is from Baah. The main color is a deeper red than this shows. The contrast is actually a pale, pale green. The child's sweater will be in a deeper green and the adult will be blue. I got the draft of the Fall issue yesterday with the children's argyle vests. The models we used (absolutely adorable) inspired these sweaters.